An important part of Mcdonald’s marketing campaigns have been their characters. Mcdonalds Characters helped get children interested in their food. The man who built Mcdonalds as an international chain, Ray Kroc, knew that children were the key to a restaurant business. To get children interested would mean young kids would nag their parents until they agree to go there. And the best way to interest children was through a bizarre range of Mcdonalds Characters. 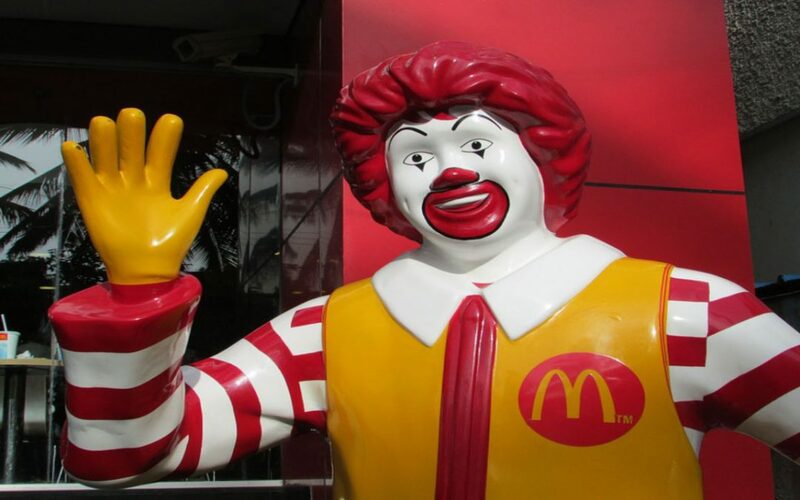 We all know about Ronald Mcdonald, but others have largely fallen out of use in recent years. So I thought I’d compile a list of ten Mcdonalds characters you forgot existed. Here they are. Grimace was a big purple monster who regularly featured in Mcdonalds tv commercials in the 1970s and 1980s. Many hours have been spent arguing about what Grimace actually is. According to Mcdonalds it’s the personification of their milkshake products. At first he was an evil character just like the hamburgler – but audiences warmed to him, and he was soon rebranded as a good guy. They changed his appearance so that children would more easily warm to him, opening the door to Grimace merchandise. As his popularity rose, commercials began to tell more about his life story and other members of his family. It was a strange chapter in Mcdonald’s history. CosMc was featured in Mcdonald’s tv commercials between 1986 and 1992. He was an alien who would trade other-worldly objects with Ronald Mcdonald in return for food. Just like everyone else, he fell in love with Mcdonalds burgers on the first taste. He was one of those characters everyone loved but was hardly given tv appearences. He was known for his voice, which you can hear in the video embedded above. He was also featured in a video game called M.C. Kids, which was a collaberative creation of Nintendo, Virgin, and Mcdonalds. That’s the impressive thing about Mcdonald’s, they diversified into every feasible revenue source. I forgot to mention – all Mcdonalds characters live together in the fictional world known as McDonaldland. Mcdonaldland is a crazy place, so it’s up to Officer Big Mac to keep it an ordered society. He’ll arrest anyone attempting to steal Mcdonalds food from the good characters. The most famous bad character is the Hamburgler; Officer Big Mac would spend much of his time keeping an eye out for him. He was easily recognized by his police outfit and massive Hamburger head. I say was, because he fell out of use during the 1980s. Iam Hungry didn’t last very long. He was a green fuzzy monster who flew through the air chomping at anything in his way. He was always hungry, hence the name, specifically for Mcdonald’s food. Ronald Mcdonald was forced to protect against Iam Hungry, otherwise he might eat all the food in Mcdonaldland. He featured in commercials between 1998 and 2001. He was even featured in an animated movie about Ronald Mcdonald in 1999. He may have been the most strange Mcdonalds character of all, which is saying a lot. McNugget Buddies are interesting. They are literally a group of living chicken nuggets. In what may have been the most blatant attempt to push their chicken nugget sales, Mcdonalds put them in tv commercials between 1989 and 2001. They are a bit creepy, but proved popular enough to launch a series of children’s toys modeled after the McNugget Buddies. You probably haven’t forgotten about this guy but I just had to include them. It would be though to ever forget the Hamburglar, Mcdonald’s most notorious villain. He wants all the Mcdonalds hamburgers for himself, but is always stopped from obtaining them all by the good characters like Ronald Mcdonald and Officer Big Mac. But Ronald Mcdonald was such a good guy he befriended the Hamburglar anyway. In a rather heartwarming way, the other characters always forgive him for stealing their food. Mcdonaldland is just that kind of place. A magical place where hamburgers are laced with LSD. I did mention earlier that the family life of Grimace received significant attention as he gained popularity. Uncle O’Grimacey received more attention than other members of the family, and for a good reason. Uncle O’Grimacey made annual appearances in order to promote Mcdonald’s limited sales of Shamrock Shakes. From what I understand Shamrock Shakes are just green colored milkshakes – but people go mental over them. Uncle O’Grimacey is the Irish uncle of Grimace, who only gets to visit Mcdonaldland once per year. It just so happens to be on St. Patrick’s Day; he brings the Shamrock Shakes with him. I think the implication there is that Irish people have their drinks green all-year-round. And they probably do. Just as I didn’t think Mcdonalds characters could get any stranger, along came the Trash Cans. They were literally a pair of Trash Cans who could move around and talk to each other. That’s really it. People would give them garbage and converse with them about nothing. For reasons I’m sure you can imagine, they were dropped from tv commercials in 1985. Their purpose was to teach children not to just throw their trash on the floor like actual animals. They had some pretty smart bow-ties too! Sundae is Ronald Mcdonald’s dog. He’s unlike the other Mcdonalds characters in that his attitude is gloomy, whereas the others are almost always jolly and upbeat. He’s quite a terrifying little thing, depicted as an operable puppet in the television show “The Wacky Adventures of Ronald McDonald”. But in commercials he was played by a real dog. So I guess Mcdonald’s have no need or care for consistency. It’s just weird that Ronald Mcdonald owned a puppet dog who suffered from depression. The Professor is a mad scientist, which is why he always wore a lab coat. It was his scientific breakthrough with allowed Mcdonald’s to produce such tasty food, and also why some of the other Mcdonalds characters even exist. Unlike most other characters he was human. We never found out much about his background, despite him being a major character during the 1980s. This was far from his origin as a minor character neglected by writers. One of his experiments actually created the McNugget Buddies, who I earlier described in this list. He was constantly coming up with new inventions which took Ronald Mcdonald and the rest of the gang on many insane adventures!